I hope you all had a great Thursday. On Wednesday I asked you all to come back and check my blog on Thursday, but I had totally forgotten that I was taking my daughter for a college visit at Indiana University and would not be posting. Please forgive my oversight. 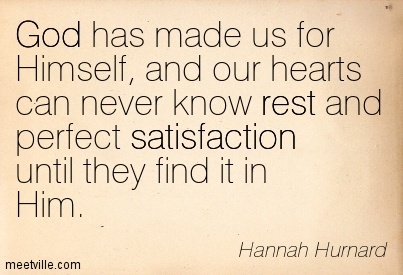 Well, even though it is Friday, I am reading to jump back in with our series on satisfaction. For your reference, I once again have included our “go-to” scripture and the questions that we are addressing in this series. On Wednesday we discussed how the first requirement to true Godly satisfaction is to be thirsty for Him because our thirst propels our need and want to spend time with Him and getting to know Him. Today, we are moving on to question number two. In order to become truly satisfied in God, you not only need to need Him, desire Him, or long for Him (thirst for Him), but you must come to a point where you know that you cannot satisfy yourself. After all, we only get our salvation when we admit we are sinners and need Jesus Christ as our Lord and Savior. It is a free gift from God upon the condition we realize we don’t deserve it and we didn’t earn it. Ephesians 2:8-9 (NIV): For it is by grace you have been saved, through faith—and this is not from yourselves, it is the gift of God— 9 not by works, so that no one can boast. Romans 11:6 (NIV): 6 And if by grace, then it cannot be based on works; if it were, grace would no longer be grace. No matter how hard we try, our works will never earn our salvation, just as our own works will never bring true satisfaction. Why is it so hard for a rich man to enter the Kingdom of Heaven? Well, often times, the more resources we have on our own, the harder it is for us to see the need for God. We tend to turn to God in times of crisis or need, but often neglect him during the good times. [I caution us all to remember the story of the Jews in Haggai we talked about Wednesday and how God likes to remind us our need for Him and we won’t usually like how he does it.] Furthermore, when we have the resources we need we come to rely on those human resources daily (such as money, food, water, etc) that we fail to come to Christ for our daily bread. God is a jealous god; he won’t share you with anyone or anything. It is best we remember so. If we get busy trying to satisfy ourselves we start to rely solely on ourselves and our own resources. We begin to treat God as an after thought or our escape clause (sort of like our very own loop-hole). No amount of money alone will make us happy because true happiness, joy, and satisfaction comes from God and walking in His will. Have a blessed weekend and I ‘ll see you next week! Very well said. I have noticed that you have a great ability to capture the complete essence of a post in a few lines. What an amazing gift!. Thank you for sharing.